For people with Chronic Lymphedema that have a limited acess to medical care, in Cyprus or any other European country, we offer the best pneumatic compression device, the famous Israeli Lympha Press devices. Home lymphedema therapy and home lymphedema treatment at it's best ! With our outstanding Lympha Press products for lymphedema traetment and lymphatic drainage we offer you more than 30 years of experience and success. The Israeli Mego Afek were the first company to manufacture multichamber sequential pneumatic compression devices in the world ! A study at the Stanford Center for Lymphatic and Venous Disorders and the Stanford University School of Medicine about the safety and efficacy of intermittent pneumatic compression therapy in patients with lymphedema proved that intermittent pneumatic compression is safe and well tolerated and may offer additional benefit for patients with lymphedema. We at P-MediCyp Ltd are proud to offer Medical Devices products for the support and treatment of Lymph disorders, Angio vascular diseases, circulatory disorders and Deep vein thrombosis prevention. We at P-MediCyp Ltd represent leading brand names like Lympah Press, Optimal, Phlebo Press, Angio Press, Phlebo Press DVT. Our outstanding sequential compression devices offer a fully variable pressure range from 20 to 80 mmHg. Our pneumatic compression devices can treats up to two limbs simultaneously, has very easy controls, are very quiet and have the reputation of being the most reliable and haevay duty in the world ! Our lymphedema products are so lightweight and portable that you can easily use them anywhere. The Lympha Press sequential compression device Lympha Press has proved time and time again as an effective treatment , for long years of home care, for cases of insufficiency of venous blood return, as a relief for varicose veins condition, as a healing aid of venous stasis ulcers and of course for Lymphedema of legs and arms, for post-mastectomy arm edema, for promotion of wound recovery, relief from muscular and nervous pain and relief from leg fatigue. Our Lympha Press line of products will enable you to recieve an hospital quality treatment at home. Combine it with the well known reliable , sturdy and portable best sequential compression devices that we are proud to offer you and you can rest assured you are getting the best home care lymphedema therapy there is today. Lipoedema, Fluid retention, Leg ulcers, Swelling (Oedema) of the breast following breast cancer treatment and Trunk Oedema or Truncal Swelling, for those who have a tendency to retain fluid and more. A must have devices and treatments in Hospitals, Medical Clinics and Spas. We at P-MediCyp Ltd are proud to present the leading basic sequential compression device, Phelbo Press, that will allow you a long years of reliable home care lymphedema therapy. The Phlebo Press is a sequential pneumatic compression system specially desigend for efficient reduction and management of peripheral edema, such as lymphedema and ulceration associated with venous insufficiency. Phlebo Press is desigend to give quality treatment at home. It is easy to use and encourages patient compliance. Phelbo Press garments feature unique overlapping 4 cell design to provide smooth and effective treatment. Phlebo Press belongs to the world famous Lympha Press family of devices, distributed and serviced by the Israeli manufacturer distributors worldwide. The Phlebo Press device is designed to treat venous disorders and lymphedema in the limbs. Operating the Phlebo Press is simple, On/Off botton and two adjustments knobs only. You can use 1 air outlet for a treatment with one sleeve or use both air outlets. You can use the hooks under the device to hang the device on the bed side. We at P-MediCyp Ltd specializes in this Medical Equipment technology and also enjoy a comphrehensive understanding of the indications and contraindications for use , so will gladly help you choose the best lymphedema home therapy. We are the sole distributors of the the famous Lympha Press family of devices in Cyprus. What are the indications for use for the home lymphedema therapy, Phlebo Press? ♦ Relief for varicose veins condition. ♦ Healing of venous stasis ulcers. ♦ Lymphedema of legs and arms. ♦ Post -mastectomy arm edema. ♦ Promotion of wound recovery. ♦ Relief from muscular and nervous pain. ♦ Relief of discomfort from leg fatigue. what are the features of the sequential compression device, Phelbo Press? ♦ Fully variable pressure range 20 to 80 mmHg. ♦ Treats up to two limbs simultaneously. ♦ Easy reading controls ( Pressure, Pause Time). ♦ Can be used on legs or arms. ♦ Compression garments consist of four fully overlapping compression cells to provide fully sequential lymph drainage. 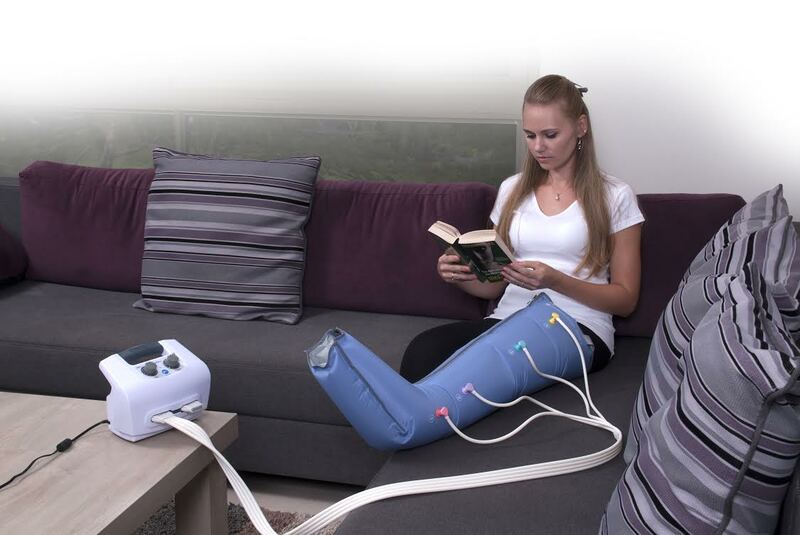 ♦ The Phlebo Press lymphedema therapy device is user friendly and can easily operated by the user or caregiver. ♦ The Phlebo Press brand from the famous Lympha Press family of products is lightweight and portable , weigh only 2.3 kg ! If you feel pain or numbness during treatment , stop the pump and open the zipper slightly. If you still experience significant pain or numbness, stop treatment and contact your physician or therapist. recommended for patients with peripheral occlusion disease. See the User Manual for additional notes and precautions. CAUTION: THIS IS A PRESCRIPTION-ONLY DEVICE. For a professional video guide about operating the Phlebo Press simply and safely and how to use the sleeve easily, click here. It is a well known fact that about 1 in 1000 adults developes DVT annually. DVT stands for Deep Vein Thrombosis and it is basiclly a formation of a blood clot, especially in our legs, and within a deep vein. The common risks factors are age, major surgey ( like knee replacement surgery and other orthopedic surgeries), trauma, obesity, chemotherapy, those that are smokers and those that can not walk or are suffering from inactivity and immobilization, have higher risk. Due to the fact that around half of the cases of DVT don't have any symptoms, it is understandable why prevention of DVT is so important ! So how to prevent DVT? Different preventative measures are used, most of them are drugs. We at P-MediCyp Ltd are concentrating on physical compression methods, for cases of immobile individuals, especially after major orthopedic surgeries like hip fracture surgery, total knee replacement and total hip replacement. We at P-MediCyp Ltd are offering Mechanical Devices, called Sequential Compression Device that are today the first choice for VTE prophylaxis and DVT prevention among Hospital patients who are at higher risk due to their limited mobility. Our Phlebo Press DVT™ from the famous Lympha Press family, manufactured by the worldwide renown Israeli Mego-Afek, is an outstanding DVT prevention device for hospital and home use. Phlebo Press DVT is a sequential compression system used for prevention of Deep Vein Thrombosis in patients who are at risk. It works by applying external compression sequentially from foot to calf in a gentle pressure wave that mimics the action of natural walking and increases venous blood flow. Phelbo Press DVT™ is used with single patient use garments with the option of foot- calf or calf only compression. The garments have four chambers each and are made of disposable, environmentally friendly materials. Phlebo Press DVT is an intermittent sequential pneumatic compression device for prevention of postoperative deep vein thrombosis. maintaining patient comfort. Calf-only sleeves are also available. vessels and maximum acceleration of venous blood flow. comfortable for the patients than traditional disposable DVT sleeves. P-MediCyp Ltd are proud to present the well known lymphatic drainage compression device in the industry. The Lympha Press Optimal is based on the reliable Lympha Press® Mini line, the Lympha Press Optimal features Pretherapy treatment for proffesional and home care patients use. The Pretherapy Treatment is a gentle massaging of the proximal lymphatics, with the purpose of easying the lymph liquids transit, based on manual lymph drainage procedures. The Pretherapy starts the treatment at the proximal end of the treated limb. Lympha Press Optimal then moves on to the main treatment, either sequential buildup pressure or Wave Peristaltic massage. We at P-MediCyp Ltd are the Cypriot distributor of the Israeli global leader in effective non-drug and non- surgical treatment of blood and lymph flow disorders, the Mego Afek. Mego Afek specializes in the manufacture of non-invasive medical devices, pressure control systems and high-frequency welded products including inflatable structures and components. ♦ Pretherapy cycle preceding all treatments. ♦ Up to 24 overlapping air cells per compression garment. ♦ Fully variable pressure range 20 to 90 mmHg. ♦ User friendly-easy to use. ♦ Compact, easy to store. ♦ Sturdy and reliable sequential compression device. ♦ The Optimal lymphatic drainage pump can treat up to two limbs simultaneously. ♦ Comptabile with most Lympha Press garments. ♦ Quick- connect connector for hose bundles. ♦ Remote control pause switch. 3. Wave Cycle ( Peristaltic dynamic compression). The Gradient feature is built into the device treatment cycles. The device ensures the pressure applied is gradually lowered as the compression sequence advances up the limb. The gradient steps and pressures can be adjusted on the device or with an easy to use PC software. What are the indications of use for the Lymph Press® Optimal? Looking for the best sequential compression device for the treatment of Lymphedema? We at P-MediCyp Ltd are proud to offer you the best pneumatic compression device in the world, the Lympha Press PCD-51™. This new and outstanding compression pump is the most economical high quality solution today for the treatment of Lymphedema. The Lympha Press PCD-51™ is a compact and portable sequential compression device that weigh only 3.3 pounds !! We at P-MediCyp Ltd are very proud to exclusively provide the Lympha Press® family of products in Cyprus. Representing the Israeli worldwide famous manufacturer of the Lympha Press® , our products enjoy 30 years of experience for treating Lymphedema and Venous Disease, Post-mastectomy Lymphedema, Post-traumatic edema and lymphedema, ulceration and more. The PCD-51™ will improve your quality of life, will help you reduce the swelling ( and other Lymphedema symptoms), will efficiently manage and reduce your peripheral edema, lymphedema and ulceration associated with venous insufficiency. With P-MediCyp Ltd outstanding and cost effective lympha press PCD-51 pneumatic compression device you will be able to treat up to two limbs at the same time. The PCD-51™ is very light weight and quiet and will make it great for travel also due to his dual-voltage capabilities. The PCD-51 is design to give quality traetemnt at home and by medical practitioners in clinics. The PCD-51 is easy to use and encourages patient compliance. The compression garments consist of four fully overlapping compression cells to provide fully sequential lympha drainage. Our PCD-51™ is so easy to use, automatically assess and adjust the garment fill time and pause interval according to garment size and then follows each inflation interval with complete defletion, for patient comfort and maximum vascular refill. The Lymph Press PCD-51™ will also assist with promotion of wound recovery, with relief from muscular and nervous pain and with relief of discomfort from leg fatigue. Watch the Lymphapress user testimonial about how the lympha press helped the lady in treating lymphedma that appeared after her breast cancer. The lymphapress pump simulate manual lympha drainage and is considered today to be a gold standard in treating post mastectomy lymphedema. Order now, the new outstanding sequential pneumatic system PCD-51 that is specificaly desigend for efficient reduction and management of peripheral edema such as lymphedema and ulceration associated with venous insufficiently and see and feel the difference. 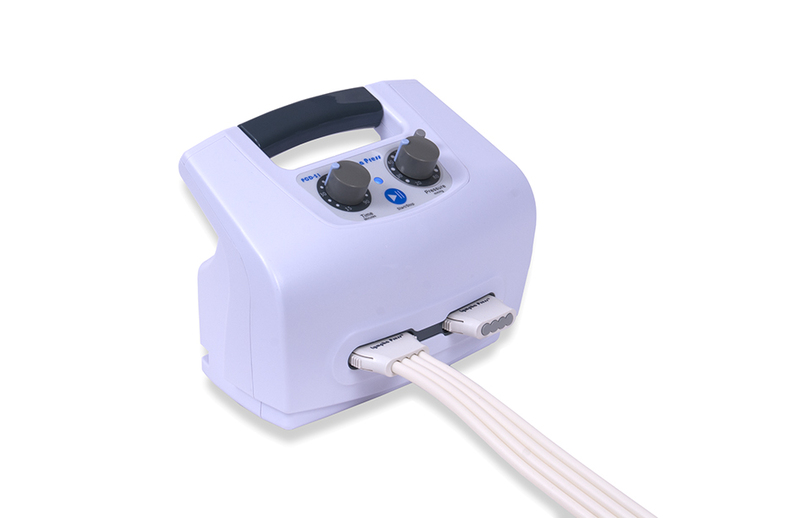 Users who bought the PCD-51 for long years of home care , for efficient reduction and management of peripheral edema, such as lymphedema and ulceration associated with venous insufficiency, have also checked the Lympha Press® Mini that feature up to 24 overlapping pressure cells that is sturdy and reliable, an hospital quality treatment at home. Lympha Press Mini- your Hospital quality treatment at home. Treating lymphedema correctly means a lifelong commitment to a regimen of care. The Lympha Press Mini is a sequential pneumatic compression system specially desigend for efficient reduction and management of peripheral edema, such as lymphedema and ulceration associated with venous insufficiency. Lympha Press Mini is desigend to give quality treatment at home. It is easy to use and encourages patient compliance. Lympha Press garments feature unique overlapping 12 cell design to provide smooth and effective treatment. Lympha Press Mini belongs to the world famous Lympha Press family of devices, distributed and serviced by the Israeli manufacturer distributors worldwide. Home therapy with the Lypmha Press Mini is easy and effective, saves clinic visits and increase patient compliance for better treatment results. What are the indications for use for the Lympha Press Mini? ♦ Lymphedema treatment- very effective for treating lymphedema of legs and arms. ♦ Post -mastectomy arm lymphedema. ♦ Up to 24 overlapping pressure cells. ♦ Fully variable pressure range 20 to 80 mmHg for safe use also at home. ♦ This outstanding lymphedema therapy device can treat up to two limbs simultaneously. ♦ Compatibe with comprehensive range of quality garments. 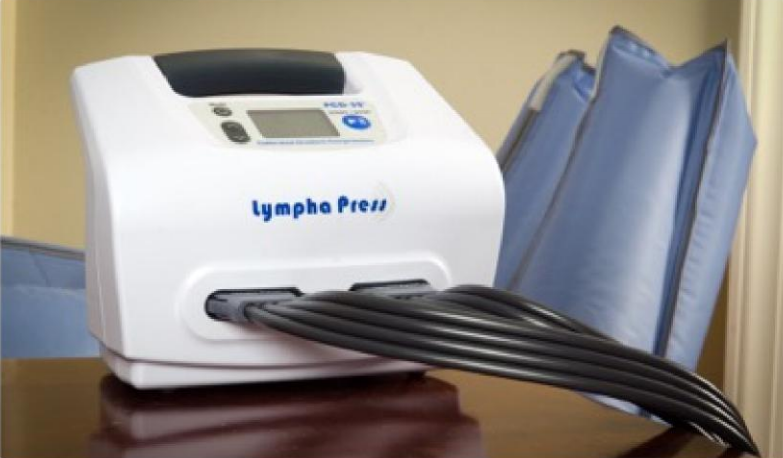 ♦ The Lympha Press Mini has an easy reading controls (Pressure and Treatment duration) so you can assured that using it will be friendly and very easy, for everyone at any age. P-MediCyp Ltd are experts in the Intermittent Pneumatic Compression devices in Cyprus so you can rest assured you are getting the best product and service ,combined with the best understanding of your needs. Customers who bought the Lymph Press Mini for home therapy of their lymphedema , for healing of venous stasis ulcers, and for promotion of wound recovery as well as relief from muscular and nervous pain, also were interested in the Phlebo Press sequential pneumatic compression system that is specially designed for efficient reduction and management of peripheral edema, such as lymphedema and ulceration associated with venous insufficiency.